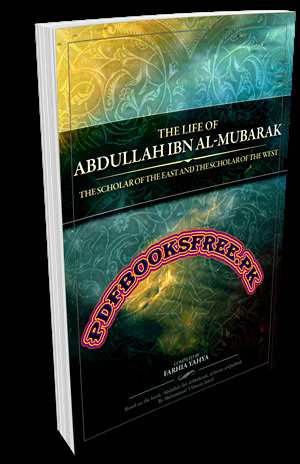 The Life of Abdullah Ibn Al-Mubarak Compiled by Farhia Yahya Scholar of East and the Scholar of West. Content of this book is based on the book “Abdullah ibn Al-Mubarak, Al-Imam Al-Qudwah” which was written by Muhammad Uthman Jamal. This book contains brief history of Abdullah ibn al-Mubarak ( 726-797 AD) who was a pious Muslim scholar from Khorasan known for his memory and zeal for knowledge. The pages of our Islamic history and heritage are filled with the lives of men and women whose influence on our history can only be retold by history itself. They served as beacons of light, illuminating the path set by this Ummah’s Messenger (sallallahu alaihi wasallam), and yet they were the heroes who protected this very path. Their interests didn’t lie in worldly gain nor were their efforts for selfish reasons but they worked hard in sincerity and under burden to deliver this message of Islam to you and I. They strove day and night purifying their societies and correcting what had become corrupt in this Ummah. They were true slaves of Allah who had put the hereafter before their eyes and hence worked only towards this one goal. One of these rarities lies in the very being of that scholar from Khurasan, the Mujahid between the army ranks, the fageeh (jurist) and muhaddith (narrator) of his time, the righteous worshiper of his Lord, the successful merchant across cities, the well-known Ascetic, the poet and writer, the grammarian and linguist, the respected and the leader of the Pious ‘Abdullah ibn Al-Mubarak. Hazrat e Abdulla bin Al-Murak history book is now available here on Pakistan virtual library for online reading and download. Check out the following links to read online or download the complete book in high quality Pdf document format and enjoy offline reading.